How to Get the Most from Your Daily Brushing and Flossing - Signature Smiles Dentistry Inc.
By Signature Smiles Dentistry Inc.
Twice a year dental cleanings are an important aspect of optimal oral health. But if you’re not brushing and flossing every day, your dental visits could change from regular maintenance to teeth rescue missions. These two hygiene tasks don’t take long—a single trip with floss around each tooth and a couple of minutes of brushing at least twice a day—but you’ll need to perform them effectively to get the most out of them. Not to worry, though: with a little practice and helpful advice from us, this small investment in time and effort could save your teeth—and your money. The first thing to know, though, is the reason behind brushing and flossing: to remove disease-causing bacterial plaque that can build up daily on teeth. Bacteria produce acid, which at elevated levels can erode enamel and lead to decay; and some bacterial strains can cause periodontal (gum) disease. These infections could ultimately lead to gum recession, bone deterioration and tooth loss. 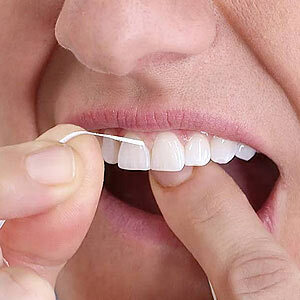 Daily brushing and flossing lowers your risk of this occurring. It’s your preference in what order you do them, but for now let’s start with flossing. There are a number of techniques—and tools—for effective flossing. If you’re using thread floss, simply cut off about 18 inches and wrap each end around the middle finger from each hand. Use the remaining fingers to create a small amount of floss between the two best fingers for a particular area of the mouth and gently pull the floss in between the tooth gap. Form a “C” shape around one of the tooth sides and rub up and down until you hear a squeak (which you’ll only hear if you use un-waxed floss). Now, repeat the action with the adjacent tooth, then move to the next and each succeeding gap and do the same until you’ve cleaned each side of each tooth. When brushing, hold your toothbrush gently like a paintbrush or pencil at about a 45-degree angle with just a small amount of toothpaste on the end bristles. All it takes is a gentle scrubbing or wiggling motion and the abrasives and detergents in the toothpaste will do the rest. Just make sure you fully brush all your teeth and gum surfaces, which should take about two minutes. Along with regular dental visits and a low-sugar diet to discourage bacterial growth, brushing and flossing will help you avoid disease and enjoy the best oral health possible.